An aging, diversifying U.S. population is prompting developers to shift their multifamily expansion plans to accommodate changing lifestyle preferences. But relocating from the city may mean a longer commute and loss of access to cultural facilities and nightlife. “The trend now is to identify suburban locations where we can design mixed-use projects that offer a bit of urbanism, including transit-oriented development and socialization opportunities,” says St. Amand. At the same time, a growing cohort of Baby Boomers and other empty nesters are opting to downsize and relocate from suburban to urban environments, often choosing to rent instead of buy. The National Multifamily Housing Council projects these demographic shifts will create demand for 4.6 million new apartment units by 2030. There’s also growing demand for more affordable urban living options that will appeal to younger clientele. Consider the 35-story Perla on Broadway condo tower under construction in downtown Los Angeles's historic theater district—the first residential high-rise built in the historic core in more than a century. Its modestly sized units and reasonable price points are intended to appeal to first-time homebuyers. It emphasizes pedestrian-oriented activities and outdoor amenity spaces such as a pool, dog walk, and active rooftop garden. “There was a lot of thinking about each of the outdoor spaces—noise levels, socialization opportunities, and especially the ability to get away to a quiet space and decompress,” says St. Amand. Cash-strapped Millennials looking to save on rent have a growing selection of co-living alternatives that offer tenants serviced rooms in shared apartments with communal lounges, kitchens, and bathrooms. In Chicago’s South Loop, the 30 East apartment community features 255 beds within 134 economically sized residential units. At the other end of the affordability spectrum are luxury condo towers such as the 62-story One Thousand Museum project under construction in Miami. Designed by the late Zaha Hadid, the building’s undulating exoskeleton is composed of 5,000 pieces of lightweight glass-fiber reinforced concrete imported from Dubai. “The use of GFRC as a permanent formwork system is a first in high-rise construction, and it increases efficiency throughout the process,” says Brad Meltzer, President of Plaza Construction. This unusual construction method consists of lightweight, hollow panels that come together to form a structure core-filled with concrete and steel. “It allows the construction team to space the building’s columns up to 40 feet apart, embracing the concept of the free plan and giving residences and communal areas an open look and feel,” says Meltzer. Lendlease reports a growing demand for complex multifamily designs that feature sloping walls, high slab heights, and large floor-to-ceiling views. In New York City’s Tribeca neighborhood, the newly opened 56 Leonard Street condominium development features atypical floor plates, cantilevered floors, and irregular balcony spacing. Each of the building’s 146 condo units is equipped with its own private outdoor space, but the unusual layout of each floor created significant logistical challenges for the construction team. Tenants are looking for flexible living spaces and the ability to personalize their home environment. NMHC's 2018 Consumer Housing Insights Survey found that 83% of respondents believed it’s important to have a space that evolves through different stages of their lives; 78% said it’s important to have a space that can change to meet changing needs. “We’re starting to design residential units differently than we have in the past, because we want to aid that ability to personalize the space and use it differently as time goes on,” says St. Amand. These units might integrate side-by-side living spaces with a sliding wall that can be reconfigured into an open environment, or “plus one” space that can be converted into a temporary bedroom or workroom. There’s also a move toward encouraging socialization among tenants via active lobbies, expanded food and beverage offerings, and numerous activity spaces. “If you have friends in the building, you’re more likely to renew your lease, and renewing leases is a major part of making pro formas work,” says St. Amand. Some of today’s most popular amenities emphasize convenience, such as built-in vestibules or valet closets to accommodate package deliveries right at the unit rather than in centralized lockers near the lobby. Architects and engineers are also starting to incorporate drone landing pads and security in preparation for the use of drones for transporting not only packages, but even people. “Given that drone transportation is not yet fully developed or legally approved, it poses an opportunity for us to solve this anticipated innovation for the industry,” says Mark Humphreys, CEO, Humphreys & Partners Architects. This scenario is but one of many that a design or construction professional might encounter while using a video game to experience a virtual construction project. The operative word here is “experience.” The construction industry has widely adopted 3D tools such as building-information models, but BIMs are still experienced in a flat, 2D environment when rendered on a screen or a piece of paper. Video games are taking these models to a new level of immersion. The first-person shooter games of the 1990s that parents, politicians and social activists came to despise—such as Doom, Half-Life and Quake—made way for more sophisticated games that serve as the backbone of virtual-reality design and construction tools. And the unruly hooligans who played them when they should have been studying? Many are now hacking into their childhood toys to make the construction industry a better and more exciting place to work. Driven by so-called video-game “engines,” or the software that runs in the background, the setup usually includes a map of the project model, with textures and visual elements that render and update in real time as you “walk” through the scene. Clash detection, which helps construction teams identify potential problems before work is executed in the real world, is a feature already built into most video-game engines. Skilled gamers and attention to detail are often required to make this possible, but the learning curve is flattening daily. A user might start by exporting a Revit model into Autodesk Maya to enhance the 3D look and then add rich textures created in Photoshop. Then, the file might run through the Unreal or Unity game engines. Instead of carrying sawed-off shotguns and searching for bad guys to blow up, the design and construction user is armed with visual tools that allow her to experience the model as a virtual, physical mock-up. The time needed to render is no longer a limiting factor. “We can pump out a two-minute animation probably in a couple of hours,” says Lucas Richmond, senior creative studio manager for Gilbane Building Co. “The traditional way [took] two to three days.” Portability is also not a problem. Perhaps the best part? The costs are insanely inexpensive. When we caught up with Richmond at the ENR FutureTech conference last fall in New York City, he demonstrated projects on an Alienware laptop. With a price tag of up to $4,000, that’s the most expensive piece of the puzzle. Video-game engines can be downloaded for free, and once a model is imported into the game, you can walk through the scene on a monitor. But if you want to “reach out and grab things,” as Richmond likes to say, you’ll also need a VR headset. This July, a $600 consumer version of the Oculus Rift headset will be on the shelves. It will include a screen sensor, remote cables and an Xbox controller. Other headsets are here or coming. Google Cardboard is an open-source VR headset that can be had for a few dollars. It turns your smartphone into a stereoscopic viewer, and construction suppliers tell ENR they plan to give away such low-tech swag at trade shows to drive interest in VR. Additionally, Samsung’s new Galaxy S7 and S7 Edge will pop into the $100 Samsung Gear headset, released last fall. Even social media apps such as Facebook plan to release VR capability. What does all this mean for construction? Game on. Ricardo Khan, senior director for project solutions at Mortenson Construction, Minneapolis, says the company has used immersive virtual-reality tools on more than a dozen projects. He says jobs best suited for such tools are large, complex facilities with tight time constraints and spaces that generate revenue. Types include health care, sports, convention centers, hospitality and higher education, although Mortenson is starting to use the technology on smaller projects, such as those under $30 million, he adds. At present, advanced visualization is most beneficial for driving early decisions in design that optimize construction, including the use of modular elements. “It wasn’t really the construction phase that was the pain point. If we were to take this gaming technology and move it into the design phase—since we were doing so much work based on negotiated price—if we could help the designers make their decisions super early, it would help us,” Khan says. After experiencing the design in a computer-assisted virtual environment (CAVE), the donor of the Pegula Ice Arena at Penn State University realized that the railing around the rink was at a height that would block the spectators’ view of the skaters. By changing the rail height before—rather than after—installation, the design team calculates that VR saved $475,000. Gaming tech is not just for building projects: Difficult industrial turnarounds and civil projects are finding ways to use these tools. 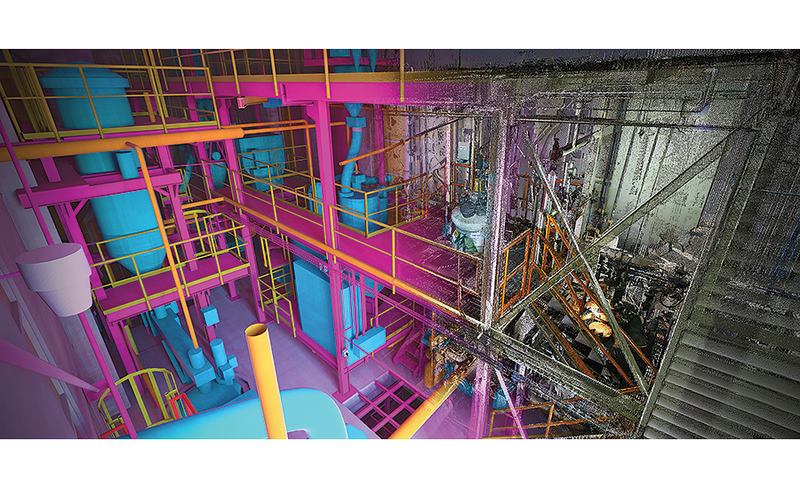 Last summer, a laser-scanning firm working for a confidential owner contracted with Chicago-based startup VIATechnik LLC to bring a point-cloud scan of a nuclear power plant into the Unity game engine. The problem was how to manipulate a 70-ft-long replacement reactor vessel through the plant without breaking other components or requiring extensive demolition. “Before we gave them the functionality to test multiple paths, we also gave them the original task,” says Danielle Dy Buncio, president and CEO of VIATechnik. “They didn’t really trust the plan 100%, which is why they engaged with us.” In this situation, it wasn’t necessary to model the game in super-high definition. But the result was valuable because the original plan would have run the vessel into a structural column. Zulps is spearheading Skanska USA’s dive into video games, with a focus on getting multiple stakeholders on projects to try out models in a virtual space. “It’s a common interface today, something like WASD [the keyboard keys used for low-tech games] and a mouse to move around,” he says. “If you can play Minecraft or Doom, getting into a model can feel very intuitive. It’s no longer someone else driving. You’re immersed in that space and can form your own interpretations of the design model.” Skanska recently hired a computer programmer skilled in the 3D Unity game engine, which it plans to use to re-create jobsite accident scenarios to help educate workers during safety training. Recalling a construction accident in which a worker was killed by a piece of falling steel, Zulps says Skanska initiated a global safety stand-down to go over the details and show a few renderings. The future addition of playable scenarios could fundamentally change safety training. “Now, we can build the incident setting accurately in Revit [and] bring it into Unity 3D. And because we have the game engine’s physics enabled, we can ‘play through’ the scenario.” Initiatives like this take the pre-shift toolbox talk to a new level, allowing workers to walk through situations virtually and learn how their decisions lead to different outcomes. “Mixed reality”—another term for augmented reality (AR)—allows users to map images onto objects in their field of vision while wearing the technology-laden DAQRI construction helmet or other specially designed visors. Another advanced version of this technology is the yet-unreleased Microsoft HoloLens, which is being developed as a consumer product so that users can play video games such as Minecraft with the game’s graphics mapped onto the world around them. HoloLens also promises to be a tool for business. Additionally, Khan believes craft work will begin to change when development kits hit the market for devices such as DAQRI. “We have been waiting for almost 10 years on AR, and now it’s time,” Khan says. Integrating the technology into the construction workflow could go well beyond the design process. At the moment, HoloLens is limited to working within controlled indoor environments, and it has trouble projecting its images onto the visor in direct sunlight. But as these technical challenges are addressed, Almagor envisions mixed reality reaching a point at which workers on the jobsite will “see” the design plans overlaid onto the actual building locations. “If I need to pour concrete on this floor, I want to make sure the sleeves for the pipes are located in the right place,” he says. Heads-up displays and intelligent labeling of environments are features already found in video games, and users familiar with these interfaces would be able to adapt quickly to these new workflows, says Almagor. “Some customers we’ve talked to want to move to a hyper-reality environment. They want to see all the data: wind simulations, energy simulations—go way beyond the design model,” he notes. Visit Metro Engineering Services at the Community Associations Institute Conference in D.C.
As one of our long-time valued friends, Metro Engineering Services would like to invite you to visit us at the annual Washington Metropolitan Chapter Community Associations Institute Conference and Expo - the premier event for community associations in the D.C. metropolitan area. The conference will take place at the Walter E. Washington Convention Center on Saturday, March 12 from 8:00 a.m. to 3:30 p.m. For more information about the conference, visit http://www.caidc.org. Metro Engineering Services offers a wide range of customized professional and engineering services focused on community associations, residential developers, and commercial property managers. Our specialties are in transition studies, structural engineering, geotechnical engineering, reserve studies and renewable energy. Don’t miss out on your chance to connect with our professional engineers to discover how we can help you learn, grow and advance your communities. Come visit us at booth #419. Our top-notch services have always made it easy to help our clients achieve their property fitness goals. Let us help you reach your physical fitness goals, too. Complete the brief survey and drop it off at the Metro Engineering Services booth, booth #419, to enter for your chance to win a Fitbit Blaze, the Firm’s way of saying thank you to the community association industry. At this year's conference, Metro Engineering Services is a Money Booth Mania Participant. For entry into Money Booth Mania and to be eligible for any of the draws you will be required to visit our booth. When you visit us, you can also enter for Metro Engineering Services' Fitbit Blaze raffle by completing our brief survey. We are looking forward to seeing you at this important event. In the meantime, please don’t hesitate to call if we can offer our assistance on a project you are planning now or in the future. Metro Engineering Services, a full-service engineering firm, is a proud supporter of the annual Washington Metropolitan Chapter Community Associations Institute (WMCCAI) Conference and Expo - the premier event for community associations in the D.C. metropolitan area. Don’t miss out on your chance to connect with our professional engineers to discover howwe can help you learn, grow and advance your communities. We bring to the table more than three decades of experience delivering customized engineering and architecture services focused on community associations, residential developers, and commercial property managers. Come visit us at booth #419. Metro Engineering Services continues to be proud of our employee's volunteer activities in their local communities and their participation in industry and charity events and other community projects. Several of our company's professionals serve in leadership positions in the industry. As you may know, I serve on WMCCAIs Editorial Committee for Quorummagazine and its Education Committee. I also serve on the Newsletter Committee for the Chesapeake Chapter of CAI. Do you want to win a Kindle Fire courtesy of Metro Engineering Services? Complete the brief survey at www.metroengservices.com/survey and drop it off at the Metro Engineering Services booth, booth #419, to enter for your chance to win a Kindle Fire, the Firm’s way of saying thank you to the community association industry. We look forward to seeing you at the WMCCAI Conference and Expo. In the meantime, please don’t hesitate to call if we can offer our assistance on a project you are planning now or in the future. Thanksgiving is the perfect time of year to share our gratitude with family and friends. From the Metro Engineering Services family to yours, we wish you a happy and healthy Thanksgiving! 2014: A Successful Year in Review - Metro Engineering Services awarded structural engineering design support contract with strategic partner, Bithenergy, for an innovative, large-scale solar farm project located in West Friendship Howard County. Rockville, MD (April 23, 2014) – Metro Engineering Services announced today that Lavina Liburd, B. Arch, MS Arch, AIA, has joined the firm as Project Architect. Liburd brings more than fourteen years of design, construction documentation and administration, and master planning experience for a range of clients and projects in the United States and the Caribbean. She focuses her architectural services on residential, multi-family condominium, civic and commercial buildings. Liburd is a seasoned manager of high-profile design projects with proven experience developing and nurturing client relationships, ensuring design specifications, and meeting financial and cultural client objectives. She has managed the design process on many different kinds of builds including condominiums, custom homes, luxury vacation villas, commercial office buildings, civic and institutional buildings, educational buildings and medical facilities. Liburd earned her Master of Science in Architecture and Urbanism from the University of California, Berkeley and is a graduate from Florida Agricultural and Mechanical University where she earned her Bachelor of Architecture. Metro Engineering Services is a full-service engineering firm located in Maryland, with clients in the D.C. metropolitan area and beyond. The company offers a wide range of customized professional and engineering services focused on community associations, residential developers, and commercial property managers. The company specializes in transition studies, structural engineering, geotechnical engineering, reserve studies and renewable energy. Metro Engineering Services is affiliated with organizations that include the American Society of Civil Engineers, American Concrete Institute, American Institute of Steel Construction, Community Associations Institute, Structural Engineering Institute, and National Association of Home Builders. For more information, visit Metro Engineering Services' website at http://www.metroengservices.com. Rockville, MD (March 12, 2014) – Metro Engineering Services announced today that it has promoted Ricky Dawson to Senior Manager, Structural. Dawson will oversee all engineering activities in Metro Engineering's structural markets and will assist in the implementation of the company’s strategic sales and marketing efforts. Dawson was hired on July 9, 2012 and brings more than15 years of experience in international civil and structural engineering to Metro Engineering. Though his core specialty is the structural engineering design of buildings, he has also designed roads, bridges, telecommunication and transportation facilities, as well as other civil structures. Dawson has practiced structural engineering in the U.S., the U.K., Europe, and Caribbean and is associated with the Institute of Structural Engineers in the U.K. He is a graduate from Morgan State University in Baltimore where he earned his Bachelor of Science degree in civil engineering. studies, structural engineering, geotechnical engineering, reserve studies and renewable energy. Metro Engineering Services is affiliated with organizations that include the American Society of Civil Engineers, American Concrete Institute, American Institute of Steel Construction, Community Associations Institute, Structural Engineering Institute, and National Association of Home Builders. For more information, visit Metro Engineering Services' website at http://www.metroengservices.com. Metro Engineering Services, a full-service engineering firm, is a proud sponsor of the annual Washington Metropolitan Chapter Community Associations Institute (WMCCAI) Conference and Expo - the premier event for community associations in the D.C. metropolitan area. Don’t miss out on your chance to connect with our professional engineers to discover how we can help you learn, grow and advance your communities. We bring to the table more than two decades of experience delivering customized engineering services focused on community associations, residential developers, and commercial property managers. Come visit us at booth #241. Metro Engineering Services continues to be proud of our employee's volunteer activities in their local communities and their participation in industry and charity events and other community projects. Our company's professionals serve in leadership positions for WMCCAI and many other organizations. As you may know, I serve on the Quorum Editorial Committee and Education Committee and frequently author articles for this outstanding magazine. Do you want to win a mini-IPAD courtesy of Metro Engineering Services? Complete the brief survey here and drop it off at the Metro Engineering Services booth, booth #241, to enter for your chance to win an IPAD, the Firm’s way of saying thank you to the community association industry. Featuring exhibits from about 190 companies and organizations, as well as 15 educational sessions focused on community associations, the 2014 WMCCAI Conference and Expo is expected to draw more than 1,700 attendees. For more information about the conference, visit http://www.caidc.org. At an address in St. Paul, Minnesota on Wednesday, President Barack Obama proposed a new, four-year transportation plan that would provide $302 billion. While urging Congress for action, President Obama made a strong case for federal investment in infrastructure and urged Congress to avoid the impending financial cliff faced by the Highway Trust Fund. Over the next four years, the President’s plan provides $206 billion for the nation’s highway system and road safety; $72 billion for transit; $19 billion for passenger rail; $9 billion for TIGER grants; and a new $10 billion freight program. To pay for the new investment and to shore up the Highway Trust Fund, the President proposed using $150 billion in one-time revenue from business tax reform. View the White House fact sheet. In response, ASCE President Randall S. Over, P.E., F.ASCE, issued an official statement on the newly proposed plan. Over concluded his statement, arguing, “Any comprehensive transportation plan must be focused on modernizing our infrastructure network in order to build a 21st century economy.” ASCE’s statement was picked up by political media and serves as a great example of ASCE’s continuing role in shaping the year ahead on transportation policy. Also this week, House Ways and Means Committee Chairman Dave Camp (R-MI) released details on his committee's proposal to overhaul the nation's tax code. This is a broad and complex piece of legislation that affects many issues beyond the scope of ASCE's legislative priorities. However, it does address some of our priorities, including an increase in the user fee that funds improvements to inland waterways, as well as an additional $126 billion for the Highway Trust Fund. Additional details and analysis on the proposal will become available in the coming weeks and ASCE will continue to monitor the legislation as it is considered by the Committee. To find out more about Transition Studies, contact Metro Engineering Services and ask to speak to one of our experts. We perform Transition Studies in Maryland, Virginia, Washington D.C. and all over the United States of American. A transition study is a thorough inspection by an engineer of a new community association's common elements to document any construction, design or condition defects. A transition study conducted by a professional engineer from Reserve Advisors provides an independent, expert opinion of how to remediate the defects and supplies local cost estimates to correct the problems. The Maryland Legislative Action Committee (MD-LAC) for the Community Associations Institute (CAI) would like to advise you of legislation that has been introduced in BOTH the Maryland Senate and House of Delegates to limit the fee that a condominium or homeowner association may charge an owner for a resale disclosure certificate. SB229 and HB412 are cross-filed versions of the same bill. Copies are attached for your reference. BOTH of these bills seek to limit the fee that can be charged for a resale certificate to "the lesser of $50.00 or the actual cost". There is a clear misunderstanding on the part of the bill sponsors about the effort that goes in to completing these documents as well as the significant liability exposure relating to the accuracy of the information provided. In addition, the bill now inserts homeowner associations into the disclosure process for which there was previously no legal responsibility. HOA disclosures have been provided as a convenience for a seller. The bills basically take the disclosure language from the Maryland Condominium Act and insert it into the Maryland Homeowner Association Act. You can see from the above that the information required will require significant time and effort to compile as a time consuming physical inspection of each property for sale will be required and some of the information that must be compiled is a "moving target". Finally and, perhaps, most significant, is that recent Maryland case law now subjects both the association and management to liability exposure to the Maryland Consumer Protection Act for inaccurate information provided on these disclosures. This is a substantial liability exposure. The limited maximum fee of $50.00 does not nearly comport with the effort or liability exposure involved with the preparation of these documents. What does this mean to your Condominium or Homeowner Association? * All HOAs are now inserted into a situation to which they previously had no legal responsibility. * Self-managed HOAs will now be forced to expend volunteer time to prepare and provide these disclosure documents within the legally mandated time frame. * Professionally managed condominium and HOAs may be saddled with additional costs to cover the differential between the true cost to prepare these disclosures and the $50.00 maximum. You may cut and paste the following into your e-mail messages or feel free to modify the message and/or create your own. I am a representative of , in , Maryland, in District , a community of homes. I am writing to express opposition to HB412 and SB229 which will limit the amount that can be charged for a resale certificate to the lesser of $50.00 or the actual cost charged to the condominium or the homeowners association. The preparation of a resale certificate, which is typically done by our management company, is significantly more than a mere clerical exercise. With respect to condominiums, in addition to providing information about the condominium itself, the law requires that the resale certificate contain information about the unit in question, such as whether there are any alternations or improvements to the unit that violates the condominium's governing documents and the amount of any unpaid assessments currently due and payable from the selling unit owner. The proposed legislation will now subject homeowner associations to the same resale disclosure requirements as those currently imposed upon condominiums. Previously, neither the homeowners association nor the management company was legally involved in a homeowners association disclosure transaction and, if there was any involvement, it was simply one of convenience for the seller. The preparation of such a certificate for a lot within a homeowners association will now require a physical property inspection, which is a time consuming process. Finally, the entity preparing the resale certificate, whether it is a management company or a condominium and, if this bill passes a homeowners association, is subject to substantial liability for any errors contained in the disclosures. In fact, recent case law in Maryland has held that errors contained in a resale certificate constitute a violation of the Maryland Consumer Protection Act. For the foregoing reasons, I am opposed to HB412 AND SB229 and urge the Committee to issue an unfavorable report. Stay tuned for future alerts! Architectural Control/Covenants Enforcement/Federal Law and Legislation: A Tennessee federal court ruled that an association’s refusal to approve a sunroom addition where handicapped children resided did not constitute discrimination under the Fair Housing Act. The Chestnut Bend community in Franklin, Tenn., is subject to a declaration of covenants, conditions, and restrictions (declaration) administered by Chestnut Bend Homeowners Association (association). Charles and Melanie Hollis reside in the community with their five children, two of whom are physically and mentally disabled. In March 2011, Melanie Hollis submitted a request to add a sunroom to her house because the awning over her patio awning was damaged by winter weather. Although she included measurements for the sunroom and a photograph of a proposed design, her application lacked the required specifications. The ARC rejected her application for aesthetic reasons and forwarded it to the board for final say. The board expressed concern about the proposed metal frame of the addition and asked Hollis to provide a more complete application. In response, Hollis mentioned her desire to create a room for her disabled children, for which she preferred the metal framework. She indicated that she wanted the addition because the tarp over the existing deck was damaged. In April 2011, Hollis’ contractor provided the ARC with more information about the addition, including renderings of the design. The ARC rejected the design and denied approval based solely on aesthetic concerns. The board also denied the request and urged Hollis to resubmit a design using brick and a shingled roof to conform to the neighborhood look. Hollis submitted a second request for a metal frame sunroom in August 2011, which still did not contain the required information. When the ARC asked about the height of the room, Hollis indicated it would sit about one foot above ground level so the two disabled children could pass easily between the sunroom and the backyard. When she was again asked to consider using brick, Hollis responded that she had been unable to find brick that matched the house. Hollis also threatened court action if the application was not approved. The board rejected the application since it still did not contain all of the required information, and Hollis refused to meet with the board. In September 2011, Hollis requested permission to build a copy of another resident’s sunroom. When the board requested additional information, Hollis for the first time explained that the purpose of the sunroom was to give her disabled children a play space. Hollis’ response also included physicians’ letters that said that a sunroom would be beneficial to the disabled children and a copy of the statute on reasonable accommodations under the Fair Housing Act (FHA). The board again informed Hollis that it could not approve the addition without a complete application. In December 2011, Hollis submitted her fourth application. It was thorough and contained all the required information. The letter accompanying the application asked that the sunroom “be a reasonable modification” under the FHA. The ARC and the board approved the application with one change—a shingled roof consistent with the neighborhood’s architectural standards. In February 2012, Hollis sued the association for discrimination in violation of the FHA. The association filed a motion for summary judgment (judgment on the merits without a trial), arguing that Hollis did not demonstrate all the necessary elements for a FHA claim. Although Hollis claimed to have submitted four requests for a reasonable modification, the court determined that the record only supported the existence of one. Under FHA, an applicant makes a reasonable modification request whenever she makes it clear that she is requesting permission because of a disability. She must explain she has a disability, the type of modification she is requesting and the relationship between the requested modification and her disability. The request must be made in such a way that a reasonable person would understand the request was made because of a disability. The court granted summary judgment to the association on claims arising from the first three requests for approval because Hollis failed to mention a relationship between the proposed addition and the children’s handicaps. The court found that Hollis’ claim as to the fourth application set forth a legally sufficient case of discrimination under the FHA because she had submitted a complete application which made clear that her children were disabled and that the sunroom was intended as a necessary home modification to enhance the children’s quality of life. The association contended that it had exercised its obligation to maintain an architectural standard and to preserve the property values of other homes in the community by not allowing improvements that were inconsistent with that standard. Hollis was aware of the declaration when she purchased her home. Moreover, the evidence clearly showed that the association’s sole focus was on the aesthetic design of the addition and its impact on the value and architectural standards of neighboring homes. Therefore, the court concluded that the association had proffered a legitimate, nondiscriminatory reason for denying Hollis’ fourth application. Hollis failed to produce any evidence to suggest that the association’s aesthetic reasons for denying the application were not legitimate. Accordingly, the court ruled in the association’s favor. ©2013 Community Associations Institute. All rights reserved. Reproduction and redistribution by CAI members or nonmembers are strictly prohibited. A Stafford, Va., woman who prosecutors say concealed her marriage and used her job at the State Department to funnel tens of millions of dollars in government contracting work to a company she and her husband ran was sentenced to two years in prison Friday. Kathleen D. McGrade, 64, who worked in a management analyst capacity for the State Department, showed very little remorse for the scheme, which authorities say allowed her to buy a $73,000 Lexus, a half-million-dollar yacht and nearly $223,000 in jewelry. In a lengthy speech before she was sentenced, McGrade offered various explanations for her misdeeds and told a federal judge in Alexandria that she was in court only because she had "been told that somehow the procurements that took place were illegal." McGrade eventually told Judge Liam O'Grady that she was "very, very sorry for all of this" and acknowledged that her "judgments were improper" - perhaps sparing herself a longer term. As O'Grady handed down the two-year sentence - far short of the five years and 10 months that federal sentencing guidelines had called for as a minimum - he said McGrade had nearly persuaded him to impose a stiffer penalty. "That was almost a delusional recitation of what has occurred here," O'Grady said. "To convince yourself that it's everybody else's fault is astonishing, given the facts of this case." The scheme first burst into public view when the Daily Caller, a news and opinion Web site, reported on McGrade and her husband, 47-year-old Brian C. Collinsworth, in 2011. Prosecutors accused the two of fraudulently winning about $53 million in contracts for their company, the Sterling Royale Group, and collecting about $39 million in payments before the scheme was uncovered. Although McGrade and Collinsworth's company - which supervised subcontractors performing heating and air-conditioning work at U.S. embassies - did the work it was paid for, McGrade and Collinsworth used McGrade's position at the State Department to unfairly edge out others for the lucrative government business, prosecutors said. By prosecutors' account, the couple's scheme hinged on a document that made Sterling Royale Group eligible for the embassy work. McGrade, they said, improperly drafted that document, then persuaded a State Department contracting officer to sign and approve it "without carefully reviewing it." McGrade disputed that at the sentencing and afterward, saying she was technically herself a "contractor" for the State Department and did not have the authority to approve such a document. She said she also did not trick the contracting officer who approved it. "The contracting officer read everything," McGrade said in court. "All I know is it was signed." Prosecutors had also accused McGrade and her husband of concealing their marriage so that they could continue to win the lucrative embassy work. McGrade said they merely failed to disclose it during a background check so as not to agitate Collinsworth's ex-wife. McGrade and her husband pleaded guilty to major fraud against the U.S. government and related charges in August - a fact that made McGrade's defiance at the sentencing even more unusual. Collinsworth, by contrast, sobbed as he apologized to a judge in no uncertain terms. "It was wrong, and we shouldn't have done it," Collinsworth said. "We're proud of the work that we did. We're not proud of the way we got the work." O'Grady sentenced Collinsworth to a year and a half in prison. McGrade's and Collinsworth's defense attorneys argued at the sentencing that their clients deserved some leniency because they did the work for which they were paid, even though they won the contracts through fraud. Assistant U.S. Attorney Jack Hanly said they deserved stiff sentences for subverting the process and unfairly cheating other companies out of work. "The government contracting community needs to be able to trust that procurements like this are run honestly," Hanly said. O'Grady said he was moved that the work was done, but he also seemed irked by the lavish lifestyle that McGrade and Collinsworth led. At one point, he listed some of the expensive items the couple had bought as he questioned their motives. "You were rocking and rolling until you got caught, weren't you?" O'Grady said. "Where's the greed come in here?" SAO PAULO - A labor court on Sunday halted construction in part of the World Cup stadium where a man fell 115 feet to his death while working on a roofing structure in the jungle city of Manaus, further delaying the venue that will host England vs. Italy and three other matches next June. The decision was announced after public prosecutors requested the immediate interruption of work in all areas where laborers need to be high above the ground. Work will only restart after constructors show that all safety measures are in place at the Arena Amazonia, which will also host United States vs. Portugal. The Manaus court said constructors will be fined a daily amount if they don't abide to the decision. The press office for constructor Andrade Gutierrez said the company would not comment until Monday. Thank you for attending the annual Community Associations Institute Chesapeake Region Chapter Exposition a few weeks ago at Martin's West, Baltimore, MD. We hope you enjoyed meeting our professionals and discovering how we can help you learn, grow and advance your communities. We also had the opportunity to visit your booth and network with some of your colleagues during the day's event. Metro Engineering Services representatives had the opportunity to meet new colleagues as well as connect with old friends. For those who were not able to attend the Expo, but would like to receive a packet of information about Metro Engineering and our services to community associations, please contact me at mbennett@MetroEngServices.com or 301-998-6141. Metro Engineering Services is a full-service engineering firm located in Maryland, with clients in the D.C. metropolitan area and beyond. We offer a wide range of customized professional and engineering services focused on community associations, residential developers, and commercial property managers. We would welcome an opportunity to share our experience and demonstrate how we can add value to your association by offering you and your colleagues a complimentary on-site Lunch and Learn program. Call Metro Engineering Services to schedule a program for your association or company. We hope that the Expo and Business Provider Showcase exceeded your expectations and gave you an opportunity to re-vitalize your community association as well. Please continue to visit www.MetroEngServices.com for industry updates, trends and highlights.We look forward to being of assistance on a project you are planning now or in the future. Thank you for attending the annual Washington Metropolitan Chapter Community Associations Institute (WMCCAI) Conference on Saturday and visiting the Metro Engineering Services booth. We hope you enjoyed meeting our professionals and discovering how we can help you learn, grow and advance your communities. Metro Engineering Services booth attendees had the opportunity to meet new colleagues, connect with old friends, and enter for a chance to win a Flat Screen TV, the Firm’s way of saying thank you to the community association industry. It is our extreme pleasure to announce that the winner of this great prize is JIM HANLEY, CMCA, PCAM. On behalf of our entire team, congratulations JIM. For those who were not able to attend the conference, but would like to receive a packet of information on Metro Engineering and our services to community associations, please contact me at mbennett@MetroEngServices.com or 301-998-6141. We hope that the WMCCAI conference exceeded your expectations and gave you an opportunity to re-energize your community association as well. We were honored to be conference sponsors! Metro Engineering Services is a proud sponsor of the annual Washington Metropolitan Chapter Community Associations Institute (WMCCAI) Conference and Expo - the premier event for community associations in the D.C. metropolitan area. Don’t miss out on your chance to connect with our professional engineers to discover how we can help you learn, grow and advance your communities. We bring to the table more than two decades of experience delivering customized engineering services focused on community associations, residential developers, and commercial property managers. Come visit us at booth #309. Metro Engineering Services continues to be proud of our employee's volunteer activities in their local communities and their participation in industry and charity events and other community projects. Several of our company's professionals serve in leadership positions for WMCCAI. As you may know, I serve on the Quorum Editorial Committee and Education Committee, architect and project manager, Tannaz Alavi, serves on the Special Events Committee, and Gregory Fabricante, project manager, serves on the Golf Committee. Do you want to win a flat screen TV courtesy of Metro Engineering Services? Complete the brief survey here and drop it off at the Metro Engineering Services booth, booth #309, to enter for your chance to win a flat screen TV, the Firm’s way of saying thank you to the community association industry. Featuring exhibits from about 190 companies and organizations, as well as 15 educational sessions focused on community associations, the 2013 WMCCAI Conference and Expo is expected to draw more than 1,700 attendees. For more information about the conference, visit http://www.caidc.org. We are pleased to share with you a recent article authored by Marvin Bennett, president of Metro Engineering, for Beacon, a quarterly magazine published by the Chesapeake Region Chapter of the Community Associations Institute (CAI/CRC). 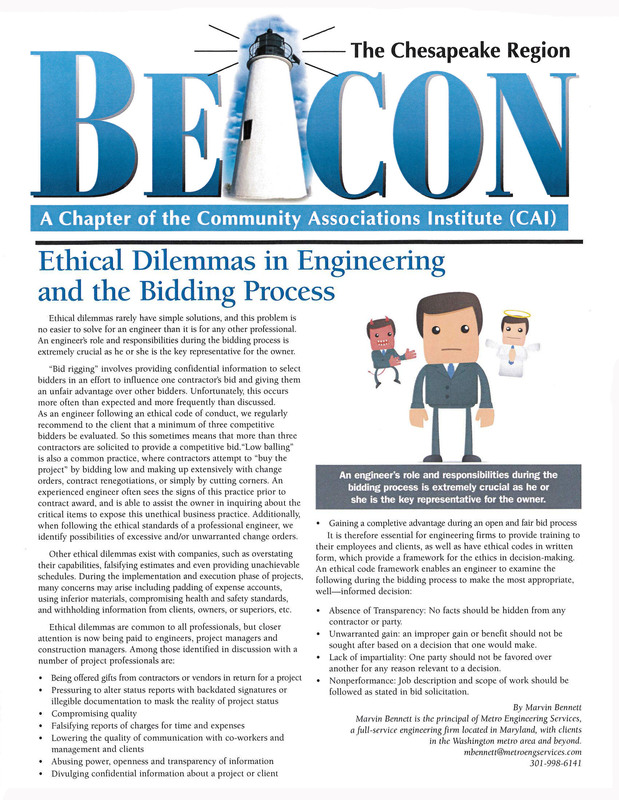 The article, “Ethical Dilemmas in Engineering and the Bidding Process,” discusses the engineer’s crucial role and responsibilities during the bidding process and the importance of following the ethical standards and codes of the professional engineering industry. You can access the article at http://www.metroengservices.com/news/, or email Marvin at mbennett@metroengservices.com to receive a copy. CAI/CRC assists professionals in the Maryland and Eastern Shore communities including professional managers and community association volunteer leaders from condominium, cooperative and homeowners associations. As an active member of the group, Metro Engineering Services is proud to provide this educational resource to the community association industry. Metro Engineering Services is thrilled with the opportunity to partner with Washington Metropolitan Chapter Community Associations Institute (WMCCAI) as one of the sponsors for their upcoming Annual Picnic. The event is a family oriented fundraiser where collected items will be donated to the Ronald McDonald House at Inova Fairfax Hospital. The company is dedicated to supporting many community and industry organizations. Visit us atwww.MetroEngServices.com for a complete list. The Annual Picnic takes place on Thursday, June 9 at The Pavilions at Turkey Run, located in McLean, VA. For more details, please visit WMCCAI Annual Picnic. This is a great event that supports a great cause. We hope to see you there! We are pleased to share with you a recent article authored by Marvin Bennett Sr., Principal of Metro Engineering Services, for Quorum, a monthly magazine published by the Washington Metropolitan Chapter Community Associations Institute (WMCCAI). As you may know, WMCCAI has close to 2,800 members including professional managers and community association volunteer leaders from condominium, cooperative and homeowners associations. As an active member of the group and president of Metro Engineering Services, I am proud to provide this educational resource to the community association industry.